Hello, everyone! 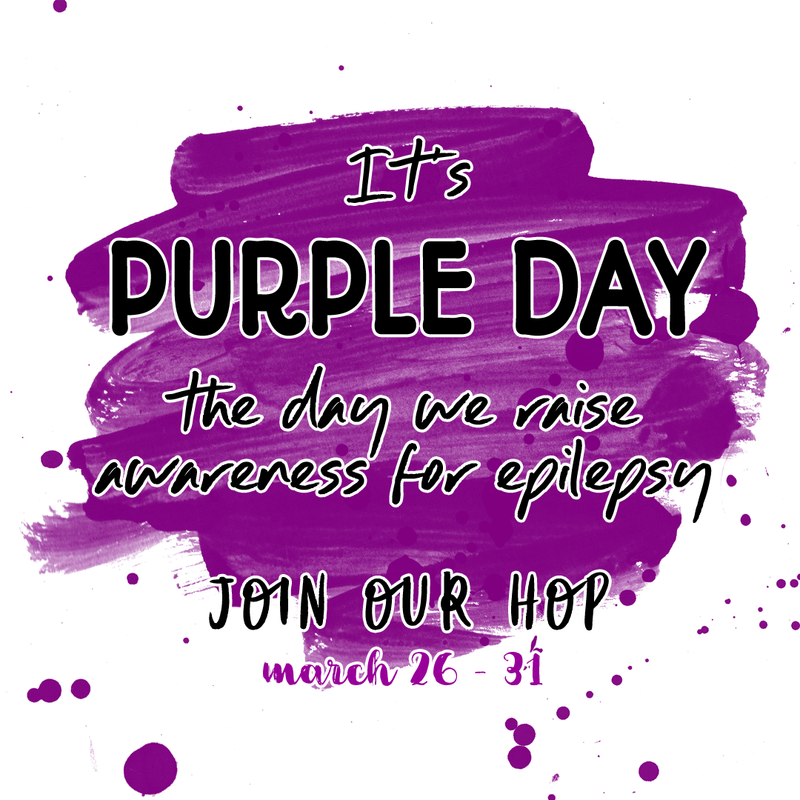 Today I'm joining my friend Fikreta in a blog hop for Purple Day in support of epilepsy awareness. Each participant in the hop has made a card featuring purple. 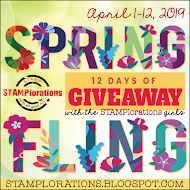 Fikreta is generously offering a giveaway, and so are many of the other blogs on the hop, including me! Please hop around and leave a comment on each blog to be entered in the giveaway draw. Details about my giveaway are below. For my Purple Day card, I made a spring scene. I coloured a cute cat image called Francoise from the Les Chats digi set by Vera Lane Studios. I won this set of four cats last fall (thank you, Carole! ), and you can see the first card I made here. This type of image is fun to colour because you can make the cat any colour you want. I went with purple! I also added some doodling. 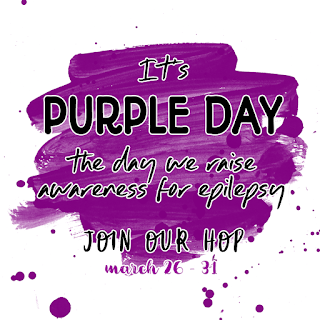 Purple Day is a global grassroots event formed with the intention to increase worldwide awareness of epilepsy, and to dispel common myths and fears of this neurological disorder. Further intentions of this movement are to reduce the social stigmas commonly endured by many individuals afflicted with the condition; to provide assurance and advocacy to those living with epilepsy that they are not alone in their ongoing endurance; and to initiate individuals living with the condition to take action in their communities to achieve these aims. The day occurs annually on March 26. Supporters are encouraged to wear a purple-coloured item of clothing. Lavender (and thus its color purple) is strongly associated with epilepsy because it has even been proven to act as a central nervous system relaxant and anticonvulsant. The concept of Purple Day was initiated by a 9-year-old named Cassidy Megan, and was motivated by her own struggle with epilepsy. The Epilepsy Association of Nova Scotia helped to develop Cassidy's idea, and the first Purple Day event was held on March 26, 2008, and is now known as the Purple Day for Epilepsy campaign. Epilepsy is a neurological disorder of the central nervous system, specifically of the brain. It is characterized by the tendency to have recurrent seizures. A person would be diagnosed with epilepsy if they have at least two unprovoked (or reflex) seizures, or one unprovoked (or reflex) seizure and are very likely to have another, or diagnosed with an epilepsy syndrome. Myth 1: You convulse (shake and jerk) when you have epilepsy. Fact 1: Not every seizure means a person jerks convulsively, nor is a person always unconscious during a seizure. Convulsions while unconscious are usually associated with tonic clonic seizures. There are a range of seizures which have different side effects and can affect people differently. Myth 2: Flashing lights cause seizures in everyone with epilepsy. Fact 2: Around 1 in 100 people has epilepsy, and of these people, around 3% have photosensitive epilepsy. Photosensitive epilepsy is more common in children and young people (up to 5%) and is less commonly diagnosed after the age of 20. Triggers differ from person to person, but common triggers include a lack of sleep, stress, and alcohol. Myth 3: You can restrain someone during a convulsive seizure and put your finger in their mouth. Fact 3: During a convulsive seizure you should never hold the person down or put anything in their mouth. It's important to know exactly what to do when someone has a tonic clonic seizure so that you can act quickly. Here are 10 first aid steps for someone who has a convulsive seizure. Myth 4: Epilepsy is rare. Fact 4: Epilepsy is anything but rare, over 500,000 people in the UK have epilepsy. That’s about one in every 100 people. There are also around 60 million people with epilepsy in the world. Anyone can develop epilepsy, it happens in all ages, races and social classes. Myth 5: The only side effects of a seizure are tiredness and being confused. Fact 5: Having epilepsy can affect people in different ways. Knowing that a person ‘has epilepsy’ does not tell you very much about what happens for them or how epilepsy affects them. For example, some people may have problems with sleep or memory and for some people epilepsy may affect their mental health. Edited to add: I was asked in the comments about the recovery position mentioned in the graphic above. Please see here for detailed instructions and photos. Thank you for asking such a great question, Bunny! 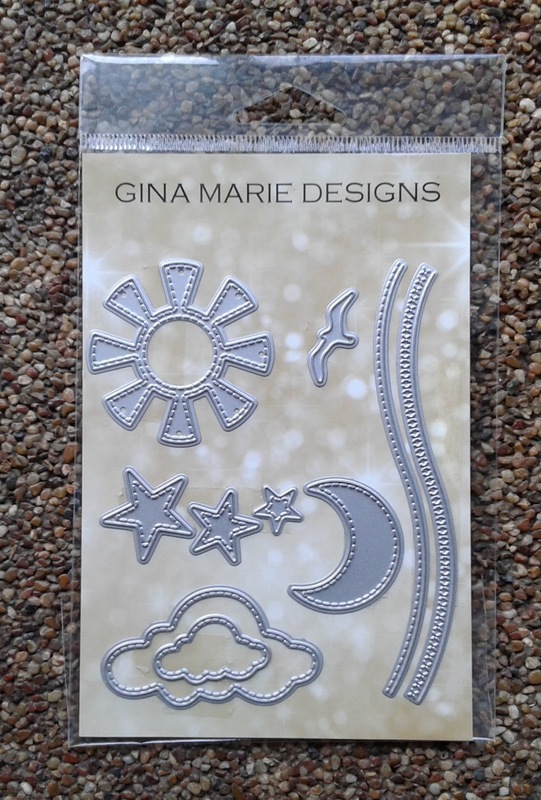 I will be giving away Stitched Sky Die Set by Gina Marie Designs (not sponsored). Please leave a comment below and include the word Purple. Comment on all blogs in the hop by Sunday, March 31, 2019, 8 p.m. Atlantic. Open worldwide. Winner to be announced here on Monday, April 1. Thank you for hopping with us! Wishing you a joyful day! Oh, my goodness, Kitty!! I LOVE your PURPLE cat!! Those Vera Lane - Les Chats stamps are sooooooooo awesome. What a lucky gal you are! Thank you for participating in this hop along with the rest of us. I've learned a lot. Hugs to you! Hello Kitty! A gorgeous card! and the kitty is so cute! Such an exciting blog hop and I am so happy to be a part of it and spread such an important message. A fabulous card for such an important event. 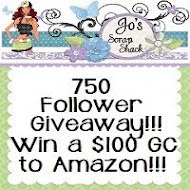 Thank you for your generous giveaway and I would love a chance to win, please. your Purple cat card made for the Purple Day Epilepsy Awareness Blog Hop is really cute.I love the colors too. The purple and white polka dot border too on the card is very cute. Thank you so much for taking part in the blog hop to create awareness on Epilepsy. May you and your family be blessed with Good health and happiness always. Thanks for posting the facts. It was interesting to read them. I do want to know what the recovery position is? I always wondered if we should try and hold someone who had seizures and was glad to read that we aren't. Still, if you can find out, ask what the recovery position is. Gorgeous card with that funny PURPLE cat. Love it as I love your participation of the good cause. What a wonderful card! It's a pleasure to see in this beautiful hop for spreading awareness in purple! I love your doodled kitty, so cute! 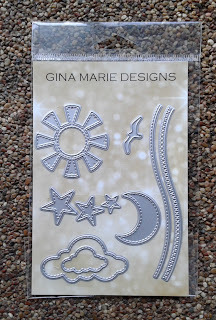 I have this embossing folder and you gave me an idea:)D, totally love it! Thanks for the chance to win this generous giveaway! your card is super adorable! Such a gorgeous cute creation Kitty for this very worthy cause. Such a beautiful card, what a coincidence- I am wearing PURPLE shirt today. Thanks for the chance to win. That is such a darling card. I love that cute kitty design. And, thanks so much for participating in this hop for a great cause. Nice prize too. Gorgeous card, I absolutely love that purple kitty! The embossed background is beautiful too! Thank you for being a part of this very important Blog Hop and I hope it brings much needed awareness! What a cute scene with this Purple cat! This is gorgeous Kitty, just love the sweet kitty! Such a fun card with that beautiful (& cute!) kitty you used. Such an awesome cause this hop is for. Such a pretty card! I have known several people with epilepsy. Thank you for sharing this informational and inspirational hop!! I learned not to hold someone having a seizure. Good info. A pretty card, such a cute cat and another lovely embossed background. What a darling purple cat card, such a darling scene for a great cause! That adorable purple kitty couldn't be more charming and what a great way to use those tiny flower gems. She looks all ready for spring time. Thanks for participating in the hop and sharing your sweet card design! 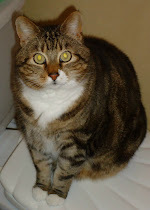 Hi Kitty, great post and Hop about epilepsy awarness! I love purple and your card looks delightful with that fun cat! Lovely doodling snd the embossed background makes the cat pop out so well!The flower gems are so pretty! Well done on all! Kitty, such an adorable card! And I love this hop and how is is helping bring awareness to epilepsy. I especially appreciate all your info about its and what to do to help. I have a friend who's husband suffers with it and the more knowledge that is out there helps everyone! Thanks for your help with this effort and Happy Purple Day! What a DARLING PURPLE cat! I am so happy you included the myths about epilepsy... very informative! I am already a follower of you :) So great of you to be a part of this awareness hop! 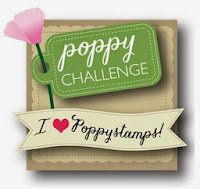 What a great cause for a blog hop! Thank you! Love your purple spring card with the cute kitty! Purple is my favorite color and eeek...that is the cutest card ever! I love the whimsical stamp and pretty sparkly flower gems. New follower here. Your purple cat is adorable and for a good cause. Love your Puple Francois! I have learned so much from this hop, and (thanks to Bunny’s question), know how to help get someone into the recovery position! Thank you for educating me. Following via Bloglovin. Adorable card! Love your purple cat, and I am already a follower here! I'm learning a lot about epilepsy awareness along the hop! I am trying to work out a way to still be able to post the butterfly challenges using the local library's free internet so keep checking back on the Buterfly blog just in case !! 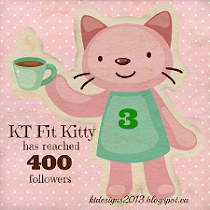 Hugs Mrs A.
I am your newest follower, Kitty. I love your PURPLE cat. Your card is fantastic. Thank you for the chance to win such a great gift. Kisses, my friend. Thank you for your informative post about epilepsy. I learned a lot, and really loved your card, too. OMGOODNESS! How stinkin' CUTE! Love the sweet scene and that kitty... it's such a fun card! Really cute image and beautiful card! Love your PURPLE cat. Fabulous creation, love the design! 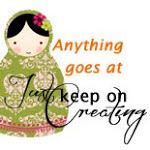 Thank you for sharing with us over at Crafty Friends and best of luck with your entry. Love to see you again next time. Thank you. Beautiful card and wonderful information. 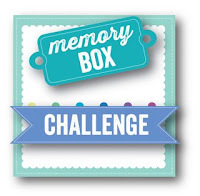 Thanks for sharing at Fun-day Friday Challenge for Jo's Scrap Shack.